Taizé brothers have been living in Alagoinhas, in North East Brazil since 1979. Their home is in a very poor neighbourhood of the city. Through the years, they have tried to reach out, to respond to the needs around them. Among the various activities they undertake are several programs for the children, among them “Emmaus”. Every morning, after prayer, some forty children come for breakfast. These are children who have no regular home; they come from very poor situations; often they are mistreated by adults. One of the things they learn at the breakfast is regularity; school starts at the same time every day! And they establish emotional ties and build up confidence in themselves and learn to behave in a socially acceptable way, especially in school. 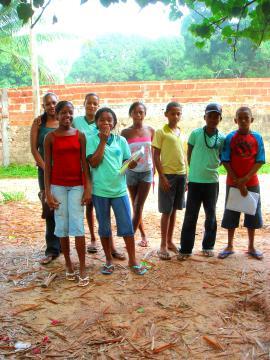 After the breakfast they go to classes specially geared to their needs, with few students and very dedicated teachers.